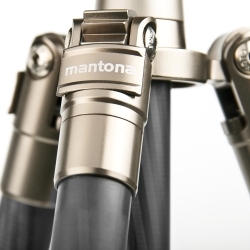 The tripod Titanium Carbon by mantona, which can be extended three times, is an absolute lightweight at merely 1.06kg and will win you over with its elegant design. 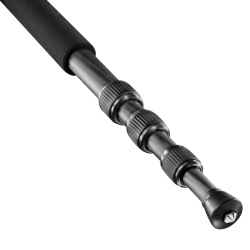 The tripod also impresses with its high-quality materials. 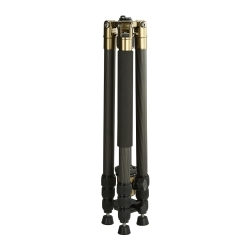 All metal parts of the tripod are covered with a special titanium alloy in several work steps, which isn’t just very long-lasting and scratch-proof, but also gives the tripod an attractive exterior. 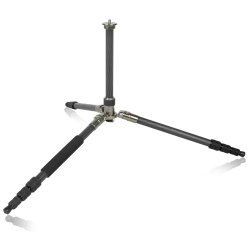 The mantona Titanium Carbon tripod is extremely functional. 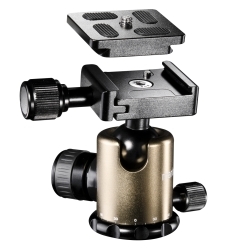 The legs can be adjusted up to an angle of 180° which makes professional macro shots possible. 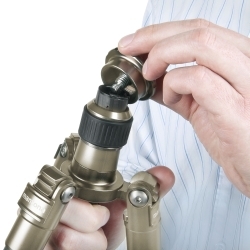 Using the tripod in an inclined position is no problem like this. The golden clips for adjusting the leg angles are easily opened, and they and the rubberized turning handles for extending the tripod legs allow flexible working. 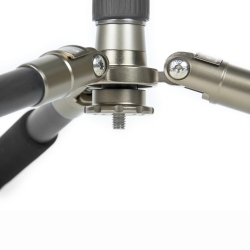 The center column of the tripod can be removed completely and fixated reversibly, so that the transport size even including the ball head is a mere 45cm. 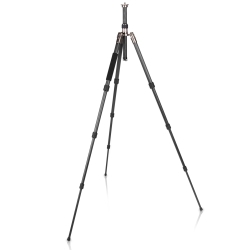 The lightweight tripod is therefore perfectly suited for photo tours.